I'm pretty new to this site and this is my first story I have submitted. This happened to me about six months ago, so please excuse me If I get a few details wrong or if my memory is a bit hazy. This experience was not my first of a ghostly encounter. All my life I've been able to see stuff the rest of my family can't see... Not to sound creepy or anything! No one else in my family really believe in this sort of stuff, only me. So I'm pretty on my own when it comes to the supernatural. But I suppose on this site I don't have to hide anymore. All of what I write is true. I don't care if you believe me or not. But this is what happened to me. I went to the battlefields of the First World War on a school trip. We stayed in a youth hostel in Belgium close to the French border. I was in a room with some of my closest friends. The first night we arrived at the hostel it was quite late and we went to bed pretty early. I remember feeling really cold in the room but everyone else said they were warm. But we all got to bed and went to sleep pretty easily. I woke up in the night at about three o clock in the morning. I could hear the sound of a battle all around me. I remember hearing gun shots and explosions and cannon-like booms. At first I thought that the TV was on but there was no way it could be that loud. I was really scared and I could pick out screams and crying amongst the artillery fire. Then they just stopped suddenly. I hope it was my own imagination. But I wouldn't be on this web site if I thought that! The next day we traveled to Ypres. 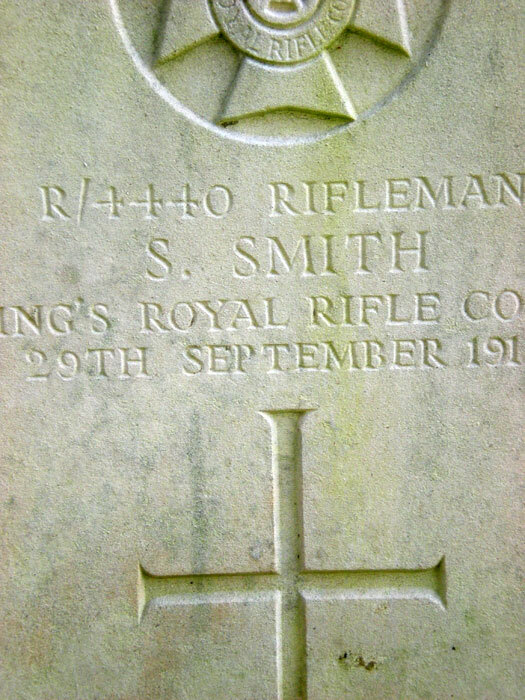 I had a great Uncle to find in Ypres Resovoir Cemetery. He was a member of the Kings royal rifle corps and died in the third battle of Ypres apparently. Well I found him. I started to cry as I stood in front of the grave. All I had was a measley poppy to give him and I felt bad after all he'd done for his country and family. Then I felt a warming presence around me that comforted me. It calmed me down and stopped me from crying. It made me feel contented and warm. The only way I can describe it is that it felt familiar. I had to move on pretty fast because everyone else was waiting on the bus for me. We moved on to the more famous sites like the Menin Gate and Pashendale. But I felt the presence following me. From one sight to the next I felt like it was there near me. 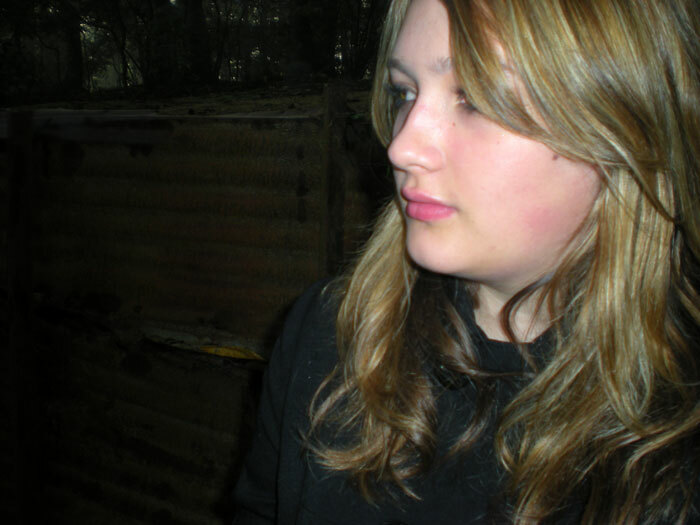 One of my friends commented that I looked a bit distracted and kept looking behind me all the time. The presence was still there when I went to sleep the second night at the hostel. Nothing happened that night. I didn't hear the noise, but when I woke up I thought I saw an outline of a person by one of my friends beds. The next day when we were all awake I asked my friends if any of them had gotten up in the night and they all said no. They asked me what was up but I couldn't tell them because they'd think I was weird. But I had a good friend in another dorm room who I would tell, he believes in the paranormal like me and is the only one I can talk to about this. But he is a male friend and I wasn't allowed in his room at that time. I managed to grab a seat next to him on the bus going to the Canadian trenches (can't remember which country it was in we had crossed the border so many times!). I told him what had happened to me since I arrived at the Somme. I could still feel the presence around me and I told him this as well. We all arrived at the sight and had a look around. The trench system is not what it used to be but you can still stand in it and have your head covered. I didn't like going through there because I felt uncomfortable. 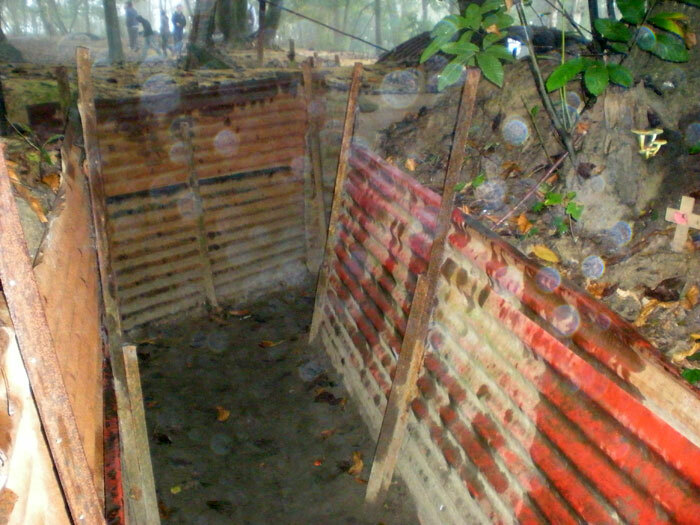 It had been raining for the past couple of days and the trench was really muddy and wet. 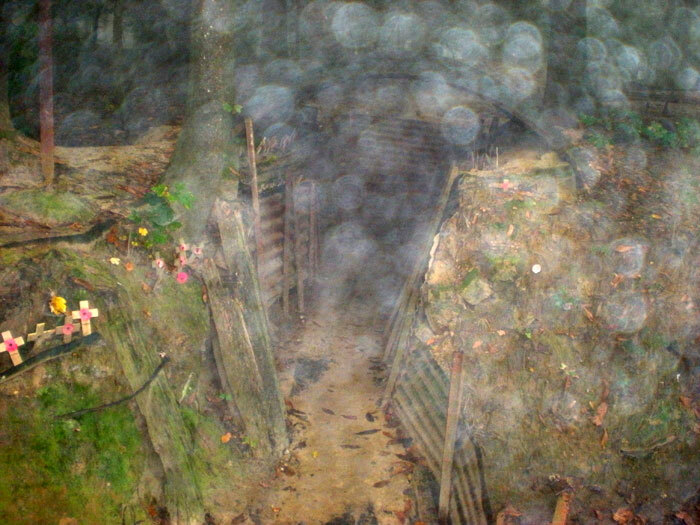 It was drizzling slightly when we were at the Canadian trenches. I hung at the back of the group with my friend and he took pictures of everyone. Later on when the photos were developed there are lots of white spots around all of us. I will try and post the photos but the spots may be rain but there weren't raindrops in the air, just a sort of wet drizzle. But my friend decided he wanted a photo of me and the rest of the group had gone off to explore. But behind my friend appeared a figure of a male soldier. It was fuzzy at first but came into focus as he got closer. I was really terrified and I looked it too, and my friend noticed it. He looked behind him and he saw the man too. I saw him fully then, and I saw that nearly all of his right arm had been blown apart. This frightened me so much I legged it away from there and my friend followed me. My friend had seen the man too so I wasn't going insane. I am still petrified whenever I think of the man. I didn't sleep at all that night at the hostel. I still felt the presence but it felt a bit distant that night. The next day our last visit was to the old English front line. Nothing happened there. But we started the journey home after that. When I got on the ferry the presence seemed to disappear and I have never felt the same presence at home. It was a terrifying trip. My friend never talks about what we saw in the Canadian trenches. I'm glad I've shared my story with you though, it will be good to know what other people make of what happened. The following comments are submitted by users of this site and are not official positions by yourghoststories.com. Please read our guidelines and the previous posts before posting. The author, Angelofmusic, has the following expectation about your feedback: I will participate in the discussion and I need help with what I have experienced. Thank you for sharing your dramatic and emotional experience at the front, Angelofmusic. Much of the physical carnage of the Great War is now gone. Many of the battlefield and cemeteries are well-tended and even beautiful, but I can not think of those places without envisioning them as a vast, turbulent maelstrom of emotion. You were sensitive to this during your visit, particularly at your great uncle's grave, and it sounds as though someone greatly appreciated your emphatetic visit and gave you a comforting hug. Your great uncle would never think that poppy measley. Your visit honored him, his interrupted life, and the wretched things he saw and endured in the army. There is nothing we can do to repay the sacrifice or ease the pain of their wartime experiences or the frustration of their unrealized ambitions--except to not forget them. I am sure your visit by itself was enough for him, so how much happier was he that you offered him a poppy?--the symbol of remembrance. In the end, I believe, what they want from us is to visit their graves, hoist a drink or light a candle and recall what they endured to make sure it is not forgotten--and you did that for your great uncle and the men who fell with him. If you are interested there is a powerful new publication, "The Faces of World War I: The Great War in Word and Pictures" edited by Max Arthur and published by Cassell Illustrated. Hello, Angel! Thank you for sharing your story with us. Those pictures are really something. I don't know what to make of them but they sure don't look like water spots to me. I suppose it could be a lighting thing because of the weather, but... Given the location, I'm more inclined to believe something else. Yeah that's me😊. Right before I saw the person behind my friend. I think I may be looking at it even! Anyway, keep them coming in the future-your experiences of the unknown. They will always be welcome here to share. Keep in touch! © The ghost story Ghosts Of The Somme is copyrighted to Angelofmusic. Edited by yourghoststories.com.